The thoroughfare between Dam square and Munt square is called Rokin. Rokin is part of what the city of Amsterdam considers its ‘red carpet’ into the city. This Red Carpet runs from Central Station via Damrak, Dam square and Rokin to Munt square and beyond. If you’re in Amsterdam for any length of time, you’ll often find yourself travelling along this street either on foot or by tram. Trams 4, 9, 14, and 16 have stops here. (Travelling north, all but 14 go to Central Station). In the 19th century this is where the well-to-do shopped. Nowadays if you can look past the over-abundance of low-class mobile phone shops, cheap souvenir stores, as well as the seemingly interminable Noord/Zuidlijn subway construction project, you’ll still find a street rich in culture. Rokin includes lots of historic buildings, a canal, a top-class archaeological museum, and plenty of clues to the history of this part of medieval Amsterdam. That said, just as with Damrak, over the decades much of Rokin’s erstwhile allure has eroded. Many classy stores have made place for cheap commerce aimed at tourists — including souvenir tat, hole-in-the-wall ‘supermarkets,’ mass-market junk food stores like Duo Penotti and Nutella’s Ice Bakery, the equally ubiquitous (and super ugly) Tours and Tickets, and the hugely forgettable ‘Amsterdam Dungeon’ tourist trap. At the same time, things are looking up. The Rokin shopkeepers’ association is making efforts to market the street as a shopping destination. Recently, Scheltema — one of the largest bookstores in the Netherlands — opened a 3200 m², five floors store at number 9, just off Dam square. Among its collection, displayed on five floors, you’ll find plenty of English-language books and magazines. A few doors down, Canada’s Hudson’s Bay warehouse will open its doors in the summer of 2017. The huge edifice, currently under construction, was supposed to have become a flagship store for Britain’s Marks & Spencer warehouse. But having been “made an offer we could not refuse” the company pulled out. Scheltema, Hudson’s Bay, and older companies are located on the east side of the street. That is where a tree-lined boulevard — complete with a fountain, benches, terraces — will soon replace the current subway construction mess. The Rokin metro station for the Noord/Zuidlijn — expected to be in operation in the summer of 2018 — will be located halfway between Dam square and Munt. Artist’s conception of the entrance to the Noord/Zuidlijn metro station at Rokin. Part of Rokin has functioned as a building pit for several years now, due to the construction of an underground station for Amsterdam’s problem-plagued new metro line. Local merchants have had a hard time making ends meet as customers have stayed away because of the construction work. Some top shops have simply closed their doors and moved elsewhere. Mind you, the lack of adequate, affordable parking anywhere in the center of town also plays a role. Famous auction house Sotheby’s in 1998 moved from Rokin to the Amsterdam suburb of Buitenveldert, at the edge of town. It cited poor accessibility by car, as well as the then promised construction of the subway station which would turn the area into a construction zone for years to come. How right they were… Originally scheduled for completion in 2011 the Noord/Zuidlijn is now said to be ready in February 2018. No Amsterdammer in his right mind believes that will happen. Meanwhile Rokin remains a busy street, with traffic flowing one way (from Munt to Dam). There’s a wide sidewalk on the West side and a narrow one on the East side. Due to the metro station construction work there currently are not many opportunities to cross the road. When you do cross, mind the bicycles. They can come from either direction, and many local bicyclists have Kamikaze blood running through their veins. Do also not get hit by a tram. The street trolleys can come from either direction. It is best to cross at a designated crosswalk. If you see people directing traffic, pay attention to them. Ignoring their orders may result in a ticket. Still, there is plenty to see and experience at Rokin. Sure there are a few buildings from designers who apparently hate the city. Why else would they come up with monstrosities that are completely out of step with their surroundings? As a for instance we’re referring to the Options Exchange building at number 65. It was designed by Cees Dam, the same ‘architect’ who can be blamed for the Stopera — the oversized ugliness that serves as combination city hall/opera building — as well as the hideous office block that defaces Dam square, right next to the beautiful building Bijenkorf warehouse. But on either side of Rokin you will also see many beautiful gables and facades. Magazijn De Gouden Bril, the oldest remaining optician in the Netherlands. The interior of this shop, built in 1918, is still largely in its original condition. The furniture is made ofCuban mahogany. Note also the decorations on the outside. They include a picture of Zacharias Janssen (ca.1588 – ca.1632), believed to be the inventor of binoculars. On the roof a carved monkey with binoculars peers at passersby. At the front of the shop are the heads of two men carved into sandstone; one with glasses, the other without. (Rokin 72). Rokin used to be a part of the delta of the river Amstel and was simply called Amstel. This branch flowed through what is now Dam square (Dam in the river Amstel: Amsteldam) and Damrak and then — beyond where you nowadays find Central Station — to the river IJ. In Old Dutch rak meant a ‘straight body of water,’ but city experts say Rokin did not get its name from that word. At first the houses at Kalverstraat extended to the water of what was then still called Amstel. At that time there were no quays. In the sixteenth century the facades of those houses, starting at Dam square, were pushed back for the contruction of a quay. Segments of those houses were simply removed. This drastic ‘retreat,’ inrukken in Dutch, is said to have given the later street its name. Amsterdam historians say that in 1559 the name Ruck-in was used. A few years later this became Rock-in, and later still Rokin. Of course there are also those who think the name came from rak plus in (e.g. the straight canal inside the city). A woodcut made by Cornelis Anthonisz in 1544 helps you visualize the situation. Small ships ferried goods from merchant vessels anchored in the harbor to Dam square. From there traders either carted the wares to Kalverstraat (where there was a market, inlcluding one for cows and calfs) or beyond. Other goods were re-loaded onto cargo boats that sailed inland via the river Amstel. Two-thirds of Rokin was filled in in 1936. Rokin as it was in 1922. From Spui to Munt square the water still flows in what Amsterdammers sometimes refer to as the ‘Natte Rokin’ (wet Rokin). At the start of the water you’ll find Rederij P. Kooij, Amsterdam’s biggest canal tour company. Taking a boat ride through the canals of Amsterdam is one of the city’s most popular tourist attractions. For us, the publishers of Dutch Amsterdam, Rederij Kooij is the canal tour company of choice. The site of its present-day offices was once home to the barge house of Glasius & Hopman, local cargo transporters. The canal tour company was started by Piet Kooij. As a schoolboy, Piet found a discarded bicycle. He fixed it up and exchanged it for a broken-down motorbike. Once he had finished restoring it he traded it in for an old boat, which he promptly sold for 500 guilders (€ 226; $ 327) — a small fortune at the time . In the winter of 1922 he stumbled across a motorboat moored at Rokin. He bought and fixed it, and since the boat came complete with a launch license decided to offer tours of Amsterdam’s canals. You can buy something to drink and get a candy bar on board of the tour boat but you’re better of bringing something yourself. The boat ride takes one hour. There is a toilet on board. There are a number of small eateries with outdoor seating along Rokin. Many are forgettable at best. Did you really come all the way to Amsterdam to eat crappy pizzas, Nutella, mass-produced ice cream, or dime-a-dozen sandwiches? Tip: make your way up the little alley (Grimburgwal) across from the Rederij Kooij ticket office and settle down at Café ‘t Gasthuys. Inside is fine; outside at the terrace alongside the canal is — weather permitting — better. Mind you, the coffee is pretty bad but the beer and food is good. At Rokin itself Brasserie Beems (at number 74) is a good choice for lunch or dinner. Good food, friendly service, fair prices, nice atmosphere. A few doors away, at number 75, you’ll find the Bierfabriek — beer factory. A brewery serving craft ales and organic grilled meals, it is the type of pub that you makes you feel good. And then there is De Drie Graefjes at Rokin 128 — an excellent place for a (late) lunch. It also has a very well-deserved reputation for excellent, American-style cakes and pastries. The old footage shows a ferry that used to cross the now filled-in water of the Rokin. The vessel carries a advertisement for Turmac, a Dutch brand of cigarettes at the time. Among other things the narrator explains that in the old days people used to dump their trash straight into the river. Therefore archeologists are working alongside the metro station construction workers. 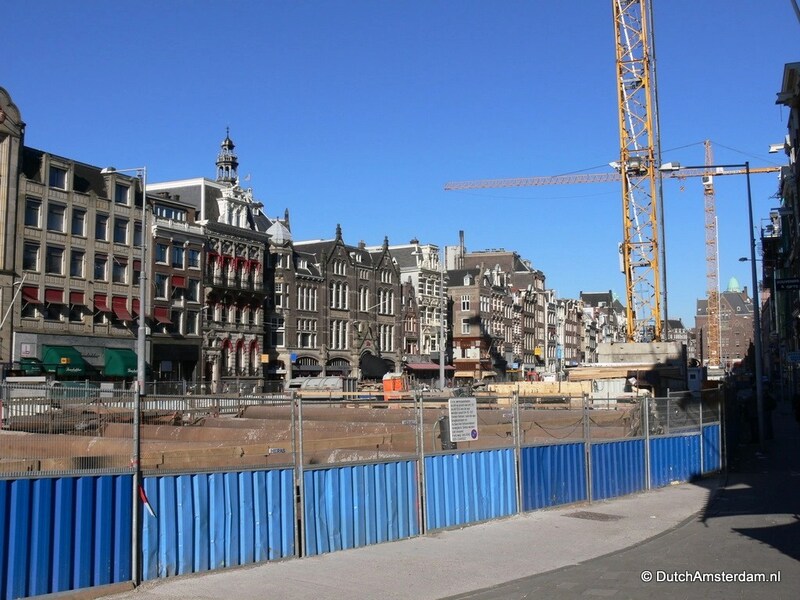 The Amsterdam Museum will at some point no doubt feature an exhibition with many of the items found during the Noord/Zuidlijn construction process. Note: as with any entry in DutchAmsterdam, this article on Rokin will be updated from time to time. The modern Rokin Plaza building — which is also home to many offices — occupies the spot where, in 1977, Hotel Polen burned down in one of the largest fires in Amsterdam’s recent history. The fire, started by someone who smoked in bed, caused 31 deaths.